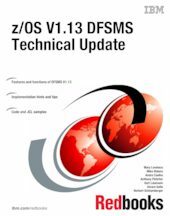 This IBM Redbooks® publication provides a summary of the functions and enhancements in z/OS V1.13 DFSMS. It provides information that you need to understand and evaluate the content of this DFSMS release, along with practical implementation hints and tips. This book also includes enhancements that are available by enabling PTFs that have been integrated into z/OS DFSMS V1.13.